Say it with words. 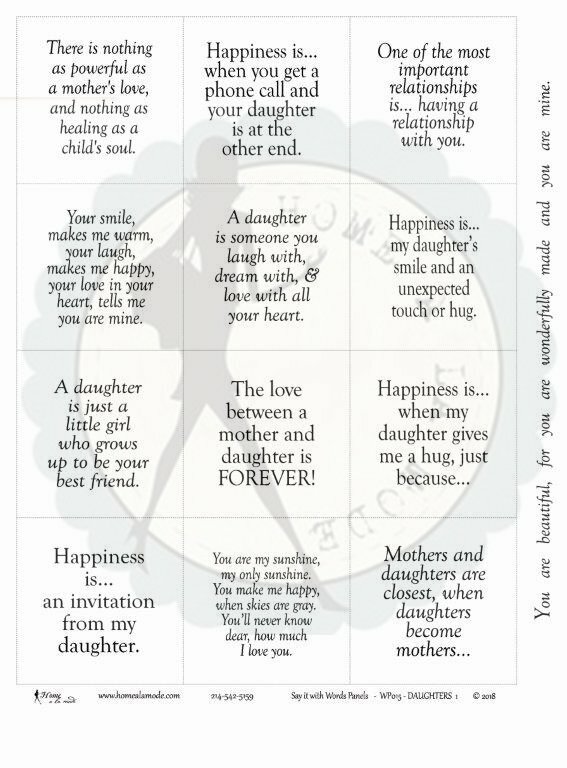 DAUGHTER is a Home a la mode word panel that is all about the serious side of our feelings and the fun learned rules for our Daughters... like: There is nothing as powerful as a mother's love, and nothing as healing as a child's soul. - Happiness is... when you get a phone call and your daughter is at the other end. - One of the most important relationships is... having a relationship with you. - Your smile, makes me warm, your laugh, makes me happy, your love in your heart, tells me you are mine. - A daughter is someone you laugh with, dream with, & love with all your heart. - Happiness is... my daughter's smile and an unexpected touch or hug. - A daughter is just a little girl who grows up to be your best friend. - The love between a mother and daughter is FOREVER! - Happiness is...when my daughter gives me a hug, just because...- Happiness is... an invitation from my daughter. - You are my sunshine, my only sunshine. You make me happy, when skies are gray. You'll never know dear, how much I love you. - Mothers and daughters are closest, when daughters become mothers... - You are beautiful, for you are wonderfully made and you are mine.